The current issue of Saveur is #135, and this recipe is from issue #60, so it’s been filed away for a few years. I’m so glad I recently unearthed it though, because it’s from a great story about the food at the exclusive China Club in Beijing. I cut out a few of the recipes from that story, and I have the page with deep fried prawns with garlic chile sauce waiting to be tried next. 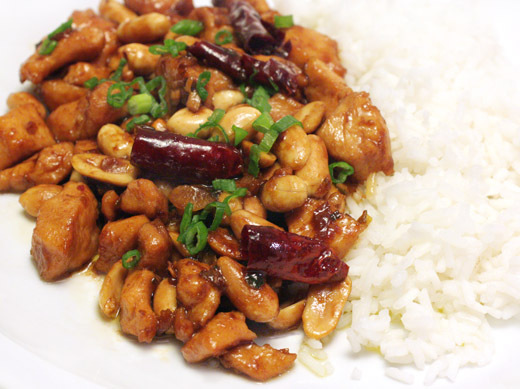 This Sichuan classic shown here today is a quick stir fry of chicken, dried chiles, and peanuts or kung pao chicken as we usually see it listed here, and this is always my choice on a take-out menu. Slowly but surely, I’m overcoming my fear of the wok and more precisely of stir frying. I loved the simplicity of making this since the most complicated part of the process was opening all those bottles of soy sauces, oil, vinegar, and shaoxing. This really was faster than waiting for take-out. You start with boneless chicken breasts and cube the meat to be mixed with cornstarch and soy sauce. That was left to marinate while everything else was prepped. Meanwhile, I steamed some rice to serve on the side. A sauce was made by stirring together soy sauce, rice wine, sugar, chicken stock, Chinese black vinegar or the mix of brown rice vinegar and balsamic I used, sesame oil, and dark soy sauce. I didn’t make up the substitution of balsamic for Chinese black vinegar; that’s suggested in the recipe. Also, a garlic clove was peeled and sliced, scallions were sliced, and ginger was peeled and minced. Then, if you have your dried chiles stemmed and chopped in half crosswise, you’re ready to stir fry. Oil was heated to the smoke point in a wok, and the dried chiles were added. They were quickly followed by the chicken, garlic, scallions, and ginger. After a few minutes, the soy sauce mixture was added and allowed to thicken. The peanuts were added, and the dish was ready. The dried chiles gave the dish a nice undercurrent of heat without making it too, too spicy, and I always like the mix of nuts and chicken in a stir fry. I mentioned this was faster than take-out, but it’s also nice to be able choose your ingredients and know all about each item that’s added to the dish. Kurt gave this a definite thumbs-up with his only request that it be made even spicier next time. I can do that, and there will be many next times of this for sure. This looks amazing. It is putting me in the mood for something Asian! Looks great, and none of that take-away gloppiness. I can envision increasing the chiles and adding Sichuan peppercorns. I love that addition of peanuts! What an awesome Chinese dish. Bill: Great idea to add Sichuan peppercorns! Kurt wanted some sliced fresh chiles too. Next time! It is hard to believe something that delivers so much flavor can be that simple to create! this says something about the ingenuity of the Chinese. Lisa, this is another beautiful creation of yours. Absolutely full flavor and makes me love Asian cuisine more than I already do. Probably shouldn't be reading this while dinner is not yet started... This is making my mouth water! Looks delicious! This sounds amazing with nuts and chiles! A terrific dish! I so love dishes like this! They are so easy to do, I would feel guilty ordering takeout. Never had this dish for some time now! But I don't like those take-outs! I love eating and cooking ding dishes, and this one looks scrumptious. My mom makes a version of this and sometimes she would add either jicama or fresh water chestnuts. HA! Lisa, this is another favourite Szechuan dish of mine. :-)) Yours looks authentic and delicious! This is the time of year I crave Asian food. After all of the heavy food/desserts eaten over the holidays, it's time for a break. The peanuts add wonderful texture to the dish. How delicious! This one looks like its brimming with flavour. A great dinner! I love rediscovering recipe gems that I've bookmarked and stored away for years. It's almost like Christmas morning all over again, especially when they are delicious like this one was! it's dishes like this that makes my day all better! thank you so much for sharing this with us..i know what i will be making for dinner tonight!! I should make it. Love those quick recipes for a weeknight Dinner. This looks so much better than our local chinese takeout. We don't own a wok, though. Do you think you could use skillet/saute pan instead? And you weren't kidding about all those bottles were you? Great shot! Shelley: You can definitely use a skillet instead. And, yes, there were lots of bottles! What a wonderful sounding recipe! looks delicious! You have managed to make me hungry looking at your delicious photographs Lisa. I love Chinese food, and will not say "no" to this ! nice and flavorful way to have a quick dinner. peanuts and chili pepper sounds awesome. Glad you overcame your wok fear!! Only time I was a little freaked out was when I had to cook on one that was over 25,000 BTU's - yikes!!! Your dish came out beautifully and your directions are excellent!! woah, you handle Chinese food with equal flair like you handle your other gourmet creation. I've eaten at China Club at Beijing and the peking duck was awesome! Lisa..I'm also a chicken with nuts fan when it comes to Asian cuisine, from Kung Pao to my usual take out order..Chicken with broccoli and cashew nuts. This looks like the best Kung Pao ever! Mouth watering photo greeting me as always when I open your site. On another note, cannot wait to see your take on the brown butter custard, cinnamon toast crumb crust etc etc etc..pie, lol. It's so luscious, seriously! 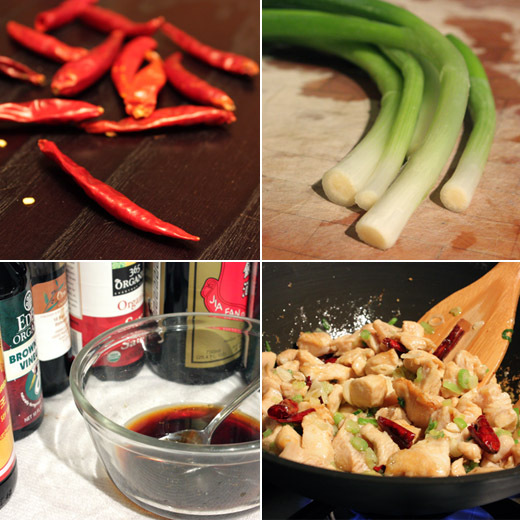 my experience making chinese food is exactly ZERO, so i read this post with fascination. what a great-sounding dish--i really should give asian cuisine another try! I hope you get an opportunity to read Grace Young's newest cookbook, Stir-Frying to the Sky's Edge....and, of course, try some of the recipes. I read the whole book from cover to cover and after telling my bookclub that this was my Julie and Julie moment....I am now on a quest to cook all 97 recipes (25 so far, not including repeats). This looks better than takeout, and more healthy too - yum! 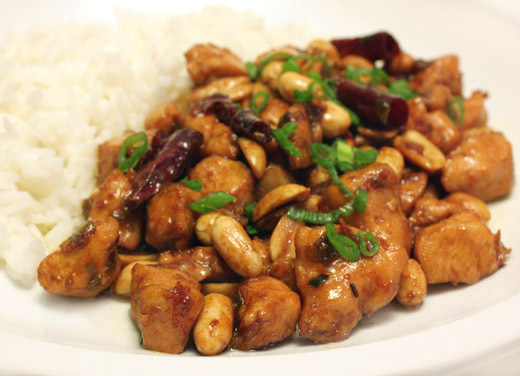 Kung Pao is my favorite and always has been since I was a little girl and my beloved neighbor treated me to dinner at a Chinese restaurant, I have judged many a restaurant on this dish and have tried to make it at home a few times but have always been disappointed in the results feeling that something was missing in the recipe. Your version looks close to the dishes I love so I am going to give it a try, besides I trust you implicitly.